In 2004, when Richard Pan held a position at a major bank in Sydney, he believed that, according to traditional standards, he was living the dream. “Since I was young, the advice I got from my parents was to study hard, get into a good school and get a good job. And that’s exactly what I did,” he says. By a twist of fate, one day he picked up an interestingly titled book that his wife had borrowed from a friend. “It was Rich Dad, Poor Dad by Robert Kiyosaki. If I had known that it was a personal finance type of book, then I wouldn’t have touched it in a million years!” he says. “I knew nothing about investing or running a business, but while I was reading this book I felt that a door to a whole new world was opening up in front of me.” Kiyosaki’s book introduced Richard to the idea of earning positive income through positively geared property investments. Initially, he wondered whether the strategy was applicable to the Sydney market, since it seemed that most of the people around him were investing in negatively geared properties for capital growth. Determined to kick off his investment journey wisely, Richard sought out mentoring in purchasing positive cash flow properties. 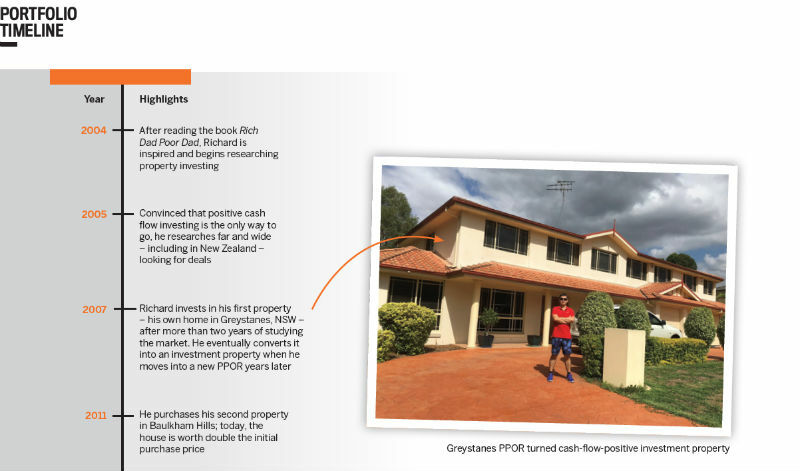 For two years, he continued to study up on the property market by reading books, attending seminars and participating in property investment workshops. “I was hitting the ground and searching for deals. I even travelled to New Zealand to search for positive cash flow deals, but was told at the time that I had missed the boat because the price had increased a lot in the last 12 months. What used to be positive cash flow investments had become neutral or even negative cash flow properties,” he says. As Richard gained theoretical knowledge, he began to seek out opportunities to put it all into practice – and that’s how his first deal was done. 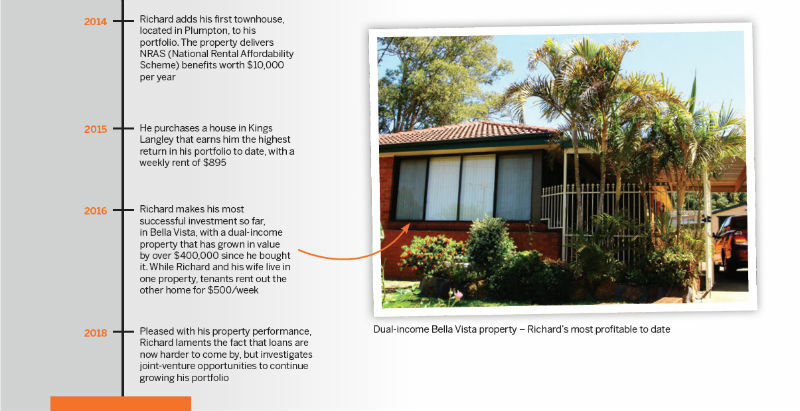 In 2007, Richard finally struck gold in Greystanes, NSW, where he bought his first house. It was initially his principal place of residence, which he shared with his wife, but he had vigorously researched the market to ensure that it would also work as a cash flow positive investment property. This home, purchased at a little over $300,000, has since ballooned in value to $730,000. “It is a common opinion that capital cities provide better chances for capital growth and regional areas give you better yield, and you just can’t have both. I used to believe that when I started out,” Richard says. “But gradually, with more knowledge and skills, I started to ask the question, ‘Why can’t I have both?’ The solution is to buy properties with two streams of income in a capital city such as Sydney. A house and granny flat is a classic example of this type of deal. Alternatively, you could look at houses that can be rented out separately side by side or upstairs and downstairs.” State regulations do come into the equation, he warns. For instance, in Victoria, tenants residing in a granny flat must be related to the main tenants or the homeowners themselves. But having a willingness to think outside the box and ask the relevant questions is an attitude that has served Richard well. 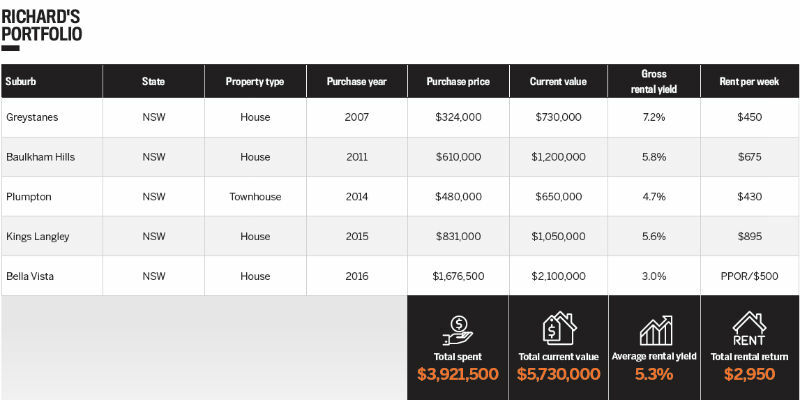 Four years after buying his Greystanes house, he bought his second property in Baulkham Hills. This was followed by three purchases over three successive years in Plumpton, Kings Langley and Bella Vista. "My attitude is that I cannot let others, even if they are big and powerful banks, tell me whether or not I can expand my portfolio. So I am weighing up my options"
The Bella Vista property, comprising a four-bedroom and a three-bedroom house side by side, is the one Richard considers his most successful investment to date. “It ticked all the boxes. The location is within 3km of a new train station, and a great new community is being built, which will attract a lot more residents and offices in the next few years. And it is in the catchment area of one of the best primary schools in Sydney,” he says. After doing some research on the property, Rchard learned that the initial selling price was negotiable. “The vendor tried to sell for $1.8m without success, and it was also passed in for an auction. It was listed for $1.65m to $1.75m. I only had five minutes to check it out and make a decision, so we put in an offer for $1.65m and got rejected,” he says. Richard was undeterred, however, and banked on the agent’s fear of losing the client if the house was not sold that day. In the end, he was able to buy the home for $1,676,500. He had some quick cosmetic renovations done on the property to enhance its value and appeal, and rented out the three-bedroom dwelling. The original homeowner actually became the first tenant. “Twelve months [after the purchase], the median price for the suburb had increased by 17.25%, so we were $290,000 better off,” Richard says. With so many restrictions on loans to investors these days, Richard acknowledges the difficulty of obtaining funds, but he continues to press forward with the confidence that he is the only one who can truly control his journey. “My attitude is that I cannot let others, even if they are big and powerful banks, tell me whether or not I can expand my portfolio. So I am weighing up my options now and checking out the possibility of doing joint-venture deals,” he says. "I was hitting the ground and searching for deals. I even travelled to New Zealand to search for positive cash flow deals"
Richard also has no intention of keeping his success strategy to himself – instead, he wants to pay it forward as his mentors did. “Recently, I began my ‘Property Investing Know How’ podcast to share my knowledge and experience with less-experienced or would-be property investors,” he says.